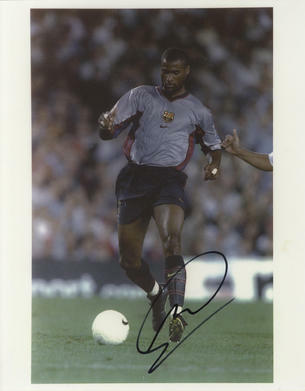 This is an In Person Signed Colour 10" x 8" Photo of the former Dutch International who made 20 Appearances for the National side seen here in Barcelona Colours. Winston Bogarde (born 22 October 1970) is a former Dutch professional footballer. A player of immense physical strength, he played mostly as a central defender, although he could occasionally appear on the left, and was best known for his spells at Ajax Amsterdam, FC Barcelona and Chelsea.